Guess who’s turning 100 this year? — Pyrex! I vividly remember my mom using Pyrex in the kitchen when I was a kid. 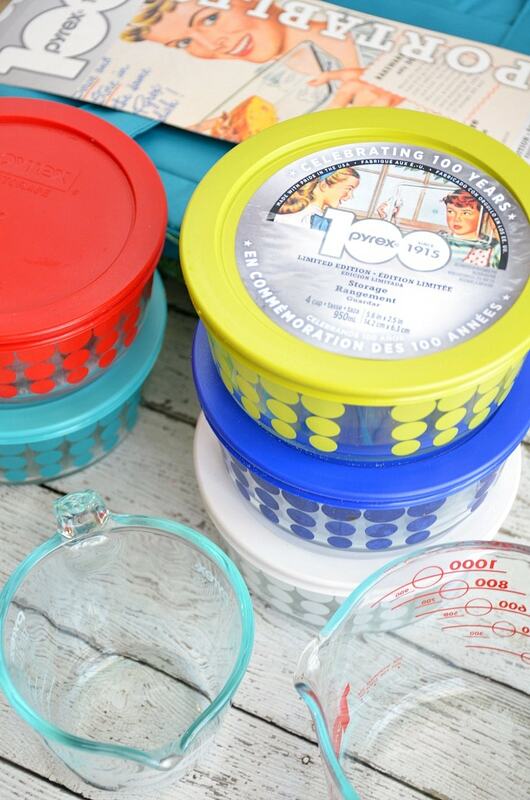 Whether it was mixing up cupcakes in a Pyrex bowl or putting the finishing touches on a casserole in a Pyrex baking dish, the iconic heat-tempered glass brand was a staple in our kitchen. I want to say the set we had was white with little orange or brown flowers. I’m sure I mocked that pattern at one point or another, but today I would do anything to have that vintage in my kitchen. Sadly, my mom sold off her old Pyrex glassware and has since upgraded to the more modern style. But… all hope is not lost! 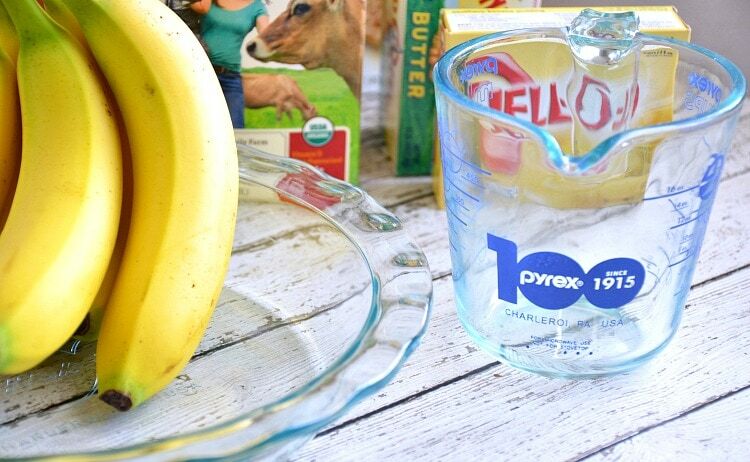 Pyrex is releasing two limited-edition product lines to celebrate their 100th anniversary. In an ode to the popular “New Dots” collection of the 1960s, both of the 2015 lines will feature the familiar Pyrex dot motif in a variety of colors. The first collection, “Centennial,” will be released in red, white, and blue, while the second collection, “Vintage Future,” features red, teal, and chartreuse products. There will also be a 100th anniversary pie plate, as well as 3 qt. portable bags. Both the “Centennial” and “Vintage Future” designs will be featured on 4-cup storage containers and Pyrex’s classic 4-cup, 2-cup, and 1-cup measuring cups. I was lucky enough to get my hands on the entire collection of new 100th anniversary products! So what did I do with my new Pyrex treasures!? Put together one of my favorite childhood recipes, of course! 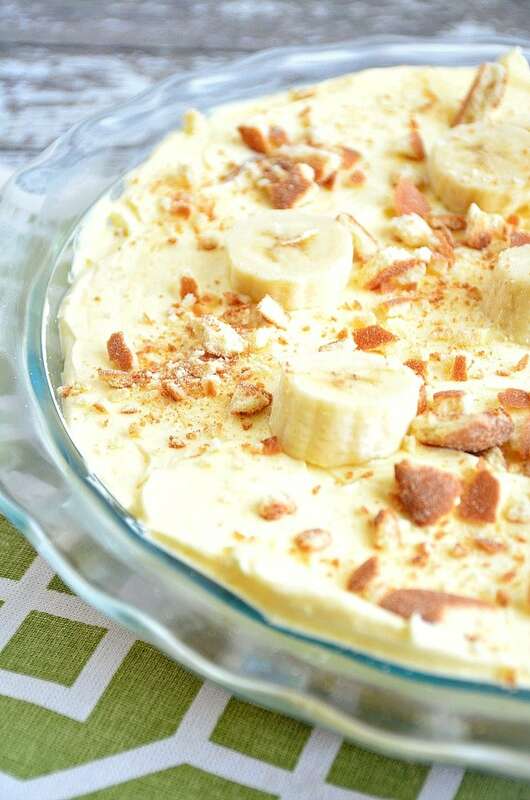 When I was young one of my most requested desserts was vanilla pudding with bananas and Nilla wafers. My mom used to layer it like a trifle, but I thought it would be fun to make it into a pie with my new Pyrex 100th anniversary pie plate. The great thing about this recipe is that it is no bake. You simple whip together a few ingredients and let them chill in the fridge. 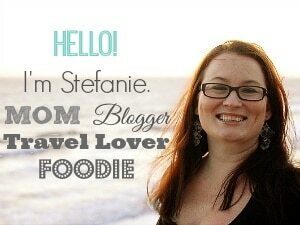 Here’s my recipe. In a Pyrex bowl, mix crushed graham crackers with melted butter. Press mixture into the bottom and side of Pyrex pie plate. Place a layer of sliced bananas onto pie crust. Add a layer of Nilla Wafers. In a separate Pyrex mixing bowl, mix instant vanilla pudding with 2 cups cold milk (approx 2 minutes). Stir in Cool Whip topping. Spread pudding mixture on top of Nilla Wafers, making sure to get all open spaces between cookies and bananas. Top with additional banana slices and crushed Nilla Wafers. Chill for 3 hours or overnight. Enjoy! Yum, right!? I’m so excited because I have a whole pie chillin’ in my fridge right now!! 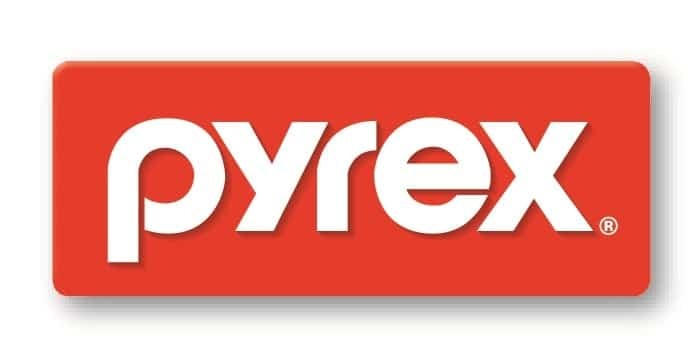 Pyrex is the way ta go!!!! I want to win. Yeah!!!! I made this recipe 2 times, it’s great thank you for publishing the recipe. I’ve made this a few times, it’s super easy and always a hit. Thanks for sharing.